As his former team continues to be lost at the quarterback position, Mark Sanchez is having solid second act of his career. Given a new lease on life in Philadelphia, the former fifth overall pick had a winning performance today, as his Eagles stole the NFC East division lead from the Cowboys. 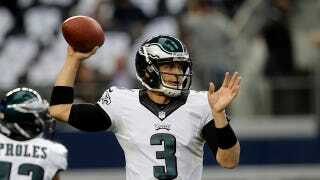 Sanchez was an efficient 20-of-29 for 217 yards and a touchdown, as well as a score on the ground. While he gave Philly steady play at quarterback, the Eagles' defense was the catalyst for the victory. Dallas could not get anything going the whole day, with Tony Romo throwing for less than 200 yards and DeMarco Murray running for less than 75. We've had two blowouts so far on Thanksgiving, but the main course is still to come, with the Seahawks and 49ers renewing their rivalry in the day's last game.